An advanced workflow platform for WordPress. Gravity Flow requires self-hosted WordPress and Gravity Forms. It’s not compatible with wordpress.com sites. Vacation requests, Purchase Orders, Admissions Forms, RFPs, Project Initiation Plans, Case Management… any form that requires a process. Developers can easily customize the functionality with actions and filters and create new step types using the Workflow Step API. Entry values can be sent to external systems at any step in the Workflow with the Webhook step. 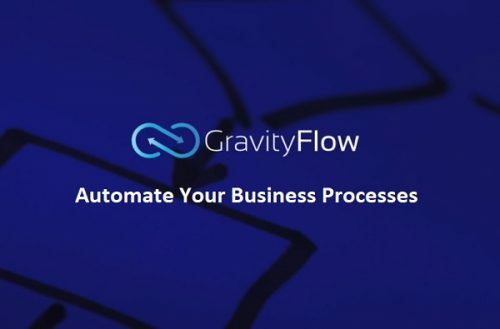 Gravity Flow runs on WordPress (Single site or Multi-Site) and requires any license for Gravity Forms. Assign Steps to Users, Roles, or Email Addresses. The Assignee doesn’t need to have a user account to participate. Simple & easy-to-use, Drag & Drop and Point & Click configuration. No programming, technical knowledge or complex training required. Configure as many Workflow Steps as you need. Drag and drop them into the right order, activate/deactivate them and add new ones as your process adapts. Steps include approval, user input/edit, notification, webhooks and integration triggers. Reports display charts by form, step and assignee so you can identify bottlenecks before they arise. Control who can submit forms, approve entries, modify values and view the status. By default users can only see the status of their own submissions. Support for field level access. Administrators can update when new releases are available with one click in the dashboard. Background updates, when enabled, will install important bug fixes and security enhancements automatically without the need for intervention from an administrator. - Added security enhancements. - Fixed an issue with due date column of inbox shortcode displaying a default value when no step settings had been defined. - Fixed an issue with the inbox incorrectly highlighting some entries as overdue. - Fixed the workflow stalling on the Dropbox step when there are no files to process. - Fixed an issue with the display of schedule date field settings.